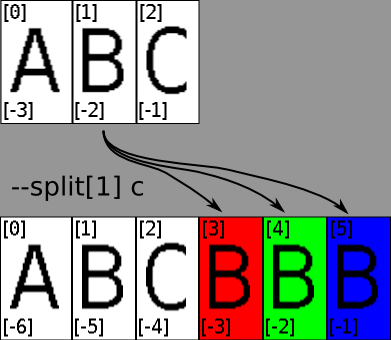 When several images are loaded in G’mic, they are ordered in a stack. 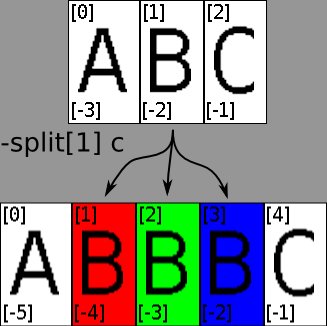 It is then possible to refer to them by using either positive (starting from the first image as ) or negative numbers (starting from the last image as [-1]). As you can see, the image A is still , but not [-3] anymore, it has become [-5]. To keep the original image, instruction are called using 2 dashes. The original image is indeed kept in place and the result is added at the end of the stack. When you apply a command to several images, sometimes, order matters. But be careful, stack order matters, not invoking order. It is possible and easy to make your own custom command in G’mic. It is written in a file that has to be called when needed. The custom commands you define have to be written in a text file. Its name is supposed to finish by the .gmic extension, but it isn’t compulsory. It is called using the command -command or its shortcut -m or by no command at all if its extension is indeed .gmic. It won’t return any error, even if it doesn’t do anything so far. [gmic]-1./my_custom_command/ *** Error in ./my_custom_command/ *** Command 'check' : expression '-400>0' is false. So far, the custom command does its job as it should, but it is still possible to improve it. # and then it will be resized! [gmic]-1./my_custom_command/ Rotate image  of 45 degree, dirichlet borders and linear interpolation. [gmic]-1./my_custom_command/ Resize image  to 50%x50%x100%x100% , with nearest neighbor interpolation, dirichlet borders and centering (0,0,0,0). But you might feel it lighter if you only get one line considering your custom command as a whole. This is done by reducing the verbosity during the execution of you command, using -v - at the start and -v + at the end. -e[^1] "My rotate-resize of $1 and $2 on image$?" You can put as many custom command as you want in one G’mic file. You can now easily make loops (-repeat … -done), if statement (-if … -elif … -else … -endif), use variables (foo=”bar” … -e $foo) and so on.